The Cygwin toolkit provides Unix tools on the Windows platform. You need only install the Cygwin toolkit if you are rebuilding from source under Windows and intend to develop your own actors using Java using third party Java packages. Rather than installing Cygwin, it may be easier to follow the Eclipse instructions and use the $PTII/.classpath.default. An alternative way to rebuild from sources on all platforms is to use Apache ant, which requires neither Cygwin nor Apache. See ant $PTII/doc/coding/ and $PTII/build.default.xml. Under Windows, the reason to install the Cygwin toolkit is so that ./configure may be run and packages like Java 3D found in your environment. The $PTII/.classpath.default file refers only to resources included in the Ptolemy II download and does not refer to other packages such as Java 3D for Windows. Eclipse users who are using third party packages will need configure the Eclipse build path by hand. Complete installation instructions can be found at http://sources.redhat.com/cygwin/faq. Compiling the Ptolemy II Matlab interface and Java Native Interface (JNI) actor requires that the a C compiler be installed. The Matlab interface requires that Matlab be installed on the local machine. Under Windows, to build the Matlab interface, it may be necessary to use MinGW from http://www.mingw.org. Recent versions of Cygwin seem to include what is necessary, so if you are building the Matlab interface, try Cygwin first and if that does not work, try installing MinGW separately. *** target pattern contains no '%'. Stop. 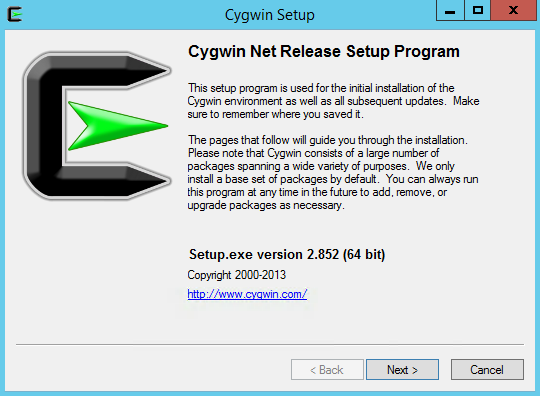 Download the Cygwin setup from https://cygwin.com/install.html. Note that there are two versions, one for 32-bit, the other for 64-bit. Most versions of Windows are 64-bit. See 32-bit or 64-bit for details. The instructions below assume 64-bit. Double click on the setup executable that was downloaded. In the "Open File - Security Warning" window, click Run. In the "Cygwin Net Release Setup Program" window, click Next. 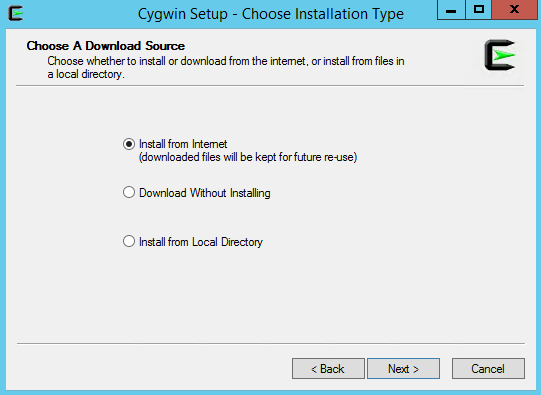 In the "Cygwin Setup - Choose Installation Type" window, keep the default of Install from Internet. and click Next. In the "Cygwin Setup - Choose Installation Directory" window, keep the default Root Directory C:\cygwin64 and Install for All Users, click Next. In the "Cygwin Setup - Choose Local Package Directory" window, keep the default and click Next. In the "Cygwin Setup - Select Connection Type" window, keep the defaults and click Next. 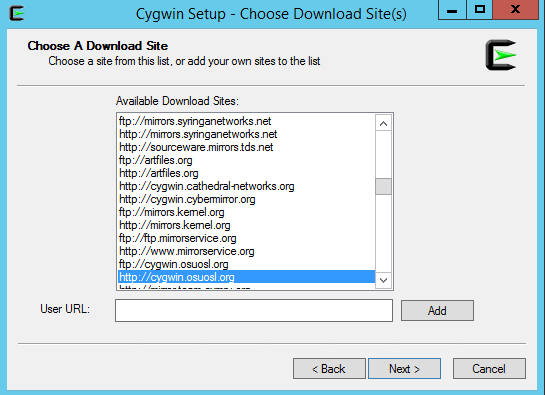 In the "Cygwin Setup - Choose Download Site(s)" window, select a nearby download site and click Next. Finally, the "Cygwin Setup - Select Packages" window comes up! This window is populated with a default set of packages to download. The "View" button on the upper right toggles through different views. 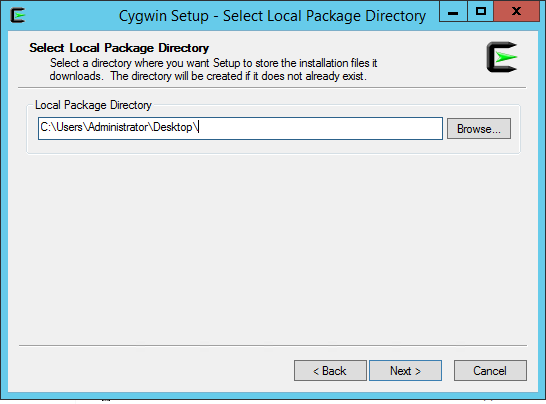 The next steps are to add a number of packages by typing the name of each of the packages below into the Search window fo the "Cygwin Setup - Select Packages" Window and then click on the "Skip" icon until the version number is displayed. In the window below, gcc-core has been entered in to the Search window and two packages have been selected. If you plan on using the Matlab interface or doing significant development, add these packages. In the "Cygwin Setup - Select Packages" window, click Next. In the "Cygwin Setup - Resolving Dependencies" window, click Next. In the "Cygwin Setup - Installation Status and Create Icons" window, select Create icons on the Desktop and Add icon to Start Menu, then hit Finish. 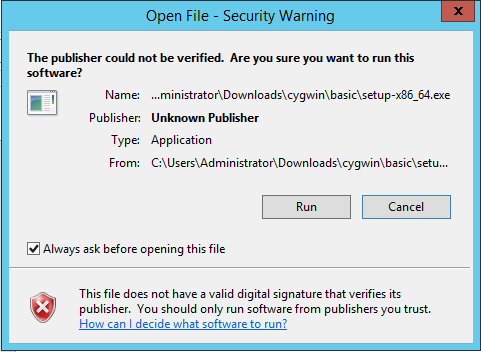 c:/cygwin64/etc/passwd is created during the Cygwin installation. If your Windows account is a domain account and not a local account, then you may need to add an entry to c:/cygwin64/etc/passwd by hand. To do this, start up the Cygwin bash shell by clicking on the Bash icon. To find your home directory, start up Cygwin bash and type cd;pwd. Then use an editor like Wordpad. http://cygwin.com/ml/cygwin-announce/2006-12/msg00026.html - The 2006 Cygwin announcement that covers this. This problem is similar to the Cygwin CR/NL problems. What has changed is that the Cygwin installer appears to no longer offer the possibility of selecting DOS as the default file type. http://comments.gmane.org/gmane.os.cygwin/115453 - discussion about the issue. 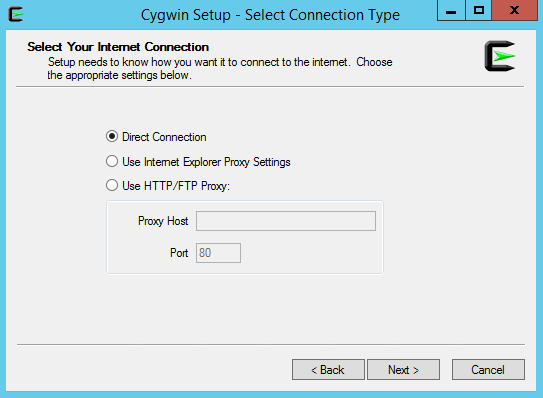 http://cygwin.com/cygwin-ug-net/using.html#using-pathnames - info about why paths like c:/ do not use /etc/fstab. http://cygwin.com/cygwin-ug-net/using.html#mount-table - Cygwin manual for /etc/fstab. Then newer versions of GNU make will fail. In the past, the default gcc compiler shipped with Cygwin produced .dll files that did not work properly. The solution is to install Mingw. MinGW may only be necessary if you are building the Matlab interface. 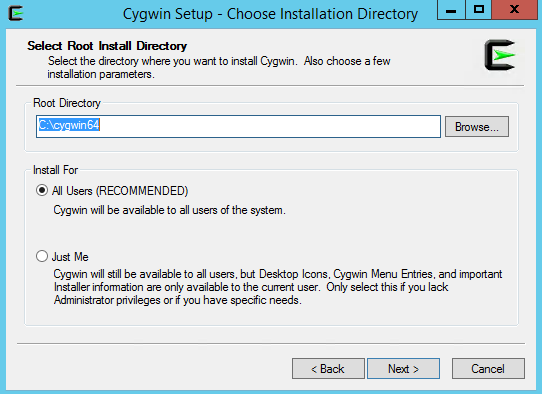 Install Cygwin either from http://www.cygwin.com or from the Ptolemy distribution. Execute mingwdl.sh, which will download the binaries into c:/mingwdl. Right-click on "My Computer" and select "Properties". Click Advanced | Environment Variables. In the box entitled "System Variables" scroll down to the line that says "PATH" and double-click the entry. You will be presented with a dialog box with two text boxes, the bottom text box allows you to edit the PATH variable. It is very important that you do not delete the existing values in the PATH string, this will cause all sorts of problems for you! Scroll to the end of the string and at the end add ";C:\mingw\bin". Don't forget the semicolon; this separates the entries in the PATH. press OK | OK | OK and you are done. You may need to enable copy and paste in the bash shell window. If copy and paste are working properly, then you should be able to highlight text by left clicking and dragging the mouse over the text and then hitting the Enter key to copy the highlighted text. How can I copy and paste into Cygwin console windows? First, consider using mintty instead of the standard console window. In mintty, selecting with the left-mouse also copies, and middle-mouse pastes. It couldn't be easier! In Windows's console window, open the properties dialog. The options contain a toggle button, named "Quick edit mode". It must be ON. Save the properties.